Golden retriever Emma and ‘little diamond’ Milli (eight) have today been confirmed as one of five finalists in this year’s prestigious Kennel Club Friends for Life competition. The winner will be announced in the main arena at Crufts on Sunday, March 10th. Emma and Milli made it through as the judges’ favourite for the hotly-contested ‘Hero Assistance Dog’ category. The Friends for Life overall winner will be decided by a public vote so you can take part. Simply visit www.crufts.org.uk and you can see all the finalists. We hope you’ll vote for Emma and Milli. Milli was born with Down’s syndrome and also suffers with a very serious heart condition. She has already undergone two open heart surgeries, the first one was when she was just four months old. It’s no surprise that her dad, Steve, calls her his ‘little diamond’. Milli’s range of conditions means that she suffers with low muscle tone, anxiety and breathlessness. This prompted her mum and dad to see what help was available for children with disabilities. 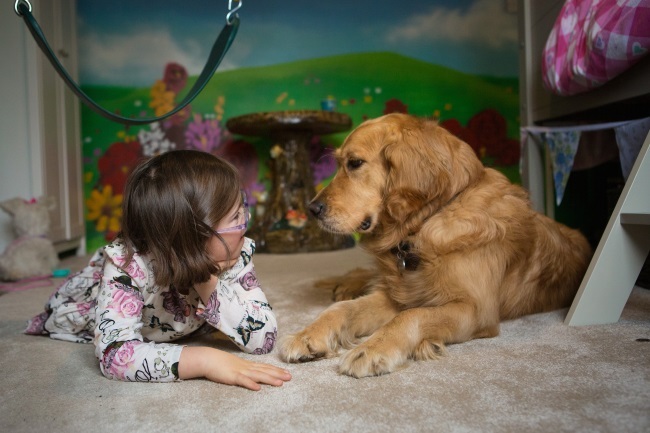 They came across Dogs for Good and learned that we were the first UK assistance dog organisation to provide dogs for children with disabilities. They were delighted when we matched Millie with Emma, a gorgeous golden retriever, last year. Emma’s specialist assistance dog training means that she is able to carry out a series of helpful tasks for her beloved friend. She does things like retrieving Milli’s medicated drinks for her when she’s lost them and delivering soothing ‘head rests’. These head rests help Milli when she gets out of breath and anxious. Currently, Emma is learning to help Milli on with her coat! The annual Friends for Life competition at Crufts celebrates the unique relationship people have with their dogs. It looks at the important role man’s best friend plays throughout our lives and the support they give us in the face of adversity. The winner of the Friends for Life competition will receive £5,000 from the Kennel Club Charitable Trust. They will give this to their chosen dog charity. The other finalists will receive £1,000 for their chosen dog charity. Please help us by voting for Milli and Emma. Just visit www.crufts.org.uk and click the button.